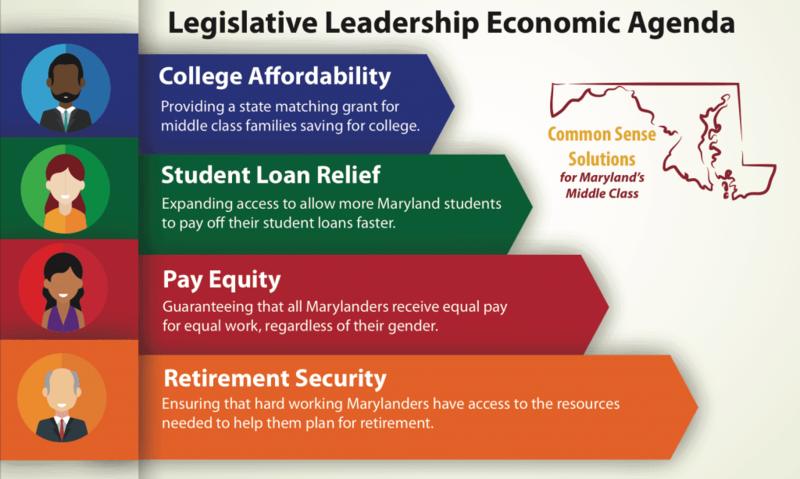 ANNAPOLIS, MD – Joined by legislators and advocates, Senate President Thomas V. Mike Miller, Jr., and House Speaker Michael E. Busch today announced legislation to support the middle-class by focusing on College Affordability, Pay Equity, and Retirement Security. Over the past eight years, the legislature has limited tuition increases at Maryland’s colleges, to bring Maryland from 7th most expensive to the 26th least expensive. Three bills this year will focus more on the student debt issue that has become a national and local problem: the average debt of a college graduate in Maryland was over $27,000 last year. To make early college savings more accessible for middle-class families, legislation will incentivize investments in 529 plans by providing a State match. This bill would impact up to 20,000 Maryland families to encourage working families to begin savings for their child’s higher education costs and reduce the amount of future debt. Legislation will also be considered to study whether the State can establish a mechanism to refinance student loan debt to more manageable payments, and report back to the General Assembly in 2017. In 2016, women make an average of 78 cents on the dollar for doing the same work as men. At the current rate, it will take 45 years for men and women to be on equal pay footing. In Maryland in 2014, a woman who holds a full time job is paid on average $49,000 per year, while a man who holds a full time job is paid $57,000 per year. Legislation will strengthen expand equal pay for equal work laws in Maryland to all employers, by ensuring that businesses cannot penalize employees for discussing salaries. The bill will also allow for greater sunlight on currently existing pay disparities and broadens existing State standards used to determine whether unlawful compensation discrimination exists. The bill specifies that the Attorney General can also enforce pay discrimination claims. With employer-sponsored retirement plans in decline across the country, and Maryland employees having only Social Security to rely on, there cannot be a further delay in providing Marylanders with a path towards economic stability in retirement. An estimated one million Marylanders lack adequate retirement savings and are at risk of financial distress when they eventually retire. More than a third of those within ten years of retirement age have saved less than $10,000. Last year, the presiding officers established an interim workgroup on retirement security & savings to work with the federal Department of Labor to identify ways that Maryland can help families save for retirement. Enables individuals with certain disabilities to establish tax-free savings accounts modeled after the popular 529 college savings plans that, if used for qualified expenses, won’t affect eligibility for means-tested public programs such as Medicaid and SSI (Supplemental Security Income). Provides an up to 5% credit against Workers Compensation premiums for implementing components of a Drug Free Workplace (employee education, supervisor training, referral to employee assistance or substance abuse programs.